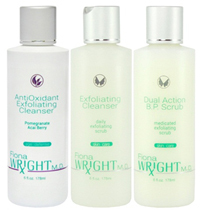 Stop Acne and Stop the Spots with Regular Exfoliation! Whether your acne is mild or more severe, regular exfoliation will soften and brighten your skin, and decrease acne breakouts. So how does exfoliation help, you may ask! When skin functions normally, oil production empties onto the skin’s surface and the dead cells are shed at a normal rate. When shedding becomes dysfunctional, the dead skin cells help create pimples when they mix with the skin oil and form a gluey plug at the hair follicle. Exfoliation is an important step in the elimination of these gluey plugs. For a spa experience with a medical treatments, Pore Cleansing Facials are recommended to tackle breakouts in two ways: skin is exfoliated so dead skin cells can’t accumulate and the pores are cleansed clean. At the doctor’s office a medical-grade professional Microdermabrasion or DermaSweep treatment can exfoliate the skin with a customized textured brush or crystal spray and a controlled central vacuum. This will loosen away the dead cells and then remove them with a soft vacuum. Exfoliation is great for many skin conditions including acne and sun damage, and is very helpful in clearing and maintaining your pores. Regular exfoliation will remove the dead skin cells and it will also remove dirt and debris that gets trapped deep in your pores. You might see what a difference it makes to your skin care even if you don’t suffer from acne! For at-home treatments, I recommend using the CLARISONIC Face Brush proven to remove 38% more dirt, debris, and dead skin (available at www.RxBeautyBar.com). You can also add it to your favorite cleanser or my AntiOxidant Exfoliating Cleanser for anti-aging and organic exfoliation, B.P. Scrub for more oily to acne-prone skin and my Exfoliating Cleanser for all skin types. Next Post All Hail King Kale!